I swore I would never do this to my own child. Yet when a few remained hot on the old-fashioned Lady Clairol, I couldn't resist. Aren't you proud of me? Not only did I buy curlers (albeit new in the box for $2), I used them! I used some hot rollers on my girl this morning. Unfortunately she has totally straight fine hair like me - so about an hour after the hot rollers came out, despite a little hairspray - her hair was almost totally straight again! My mother did the same to me. The soft, smooth curls are worth it, although I doubt Elise agrees. sister used to use those! I bet your little sweetie felt all grown-up and girly. Bet she was gorgeous! 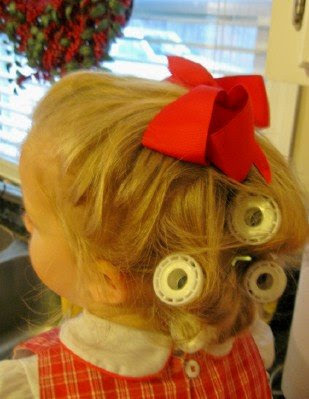 So funny -- I was coveting some rollers today to use in my daughter's hair tomorrow. Edi -- I and my daughter have the sort of hair that lets go of curl from rollers. What works for us is those velcro rollers. If you lightly spray the hair before rolling it and then spray it lightly while it is in the rollers and then let them sit in the hair for as long as you can -- my daughter in antsy after about a half hour, max -- they seem to work better for us. Maybe it will work for you, too! Old-fashioned cuteness! And that golden hair--just gorgeous! How funny! I just came online after putting two of my girls in sponge rollers, albeit, the older one needs curls for her part in the Nutcracker tomorrow (the little one was coveting the curls, so I did hers too). I love the way curls look on little girls. Maybe I'll put the middle one in hot rollers for when we see the ballet tomorrow. 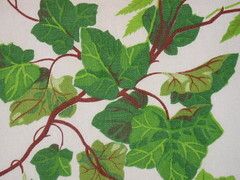 Oh, and I want to see a picture of how they turned out! awe she is going to look so sweet,I used them on my daughters many times. Meredith this brings back memories. When my girls were little I would wash their hair and put rollers in for curls. Now with Jamie's little ones I do the same thing. They think it is funny as I do not think their mama has done it. She didn't seem to mind, except for that whole searing-the-scalp and digging-into-my-head-with-pins part. The awful thing was that it started pouring a cold, misty rain just as we left for the party, so neither of us ended up with pretty hair by the time we arrived. Beauty is pain. I'm sure it was worth it in the end! In the future, use some hair clips instead of the pins. The clips clamp over the roller, and it won't hurt the way the pins can. Oh, and a towel around her neck will help with the feel of hot rollers hitting the skin. Just a couple of suggestions. I'm a hot roller pro. yip, i have some garage saler electric curlers and i tried them a few times on abby - not a huge hit w/her LOL! I bet your daughter really looked cute with her perfect curls. I guess all the time spent on putting on those curls is worth it. My daughter wouldn't allow me to put curlers on her hair. Maybe if she'll get older I can try again. My girls are grown up. We still drag out the hot rollers for those special occasions. They seem to make our beautiful redheads even prettier than ever. Your sweetie looks like she was the prettiest girl at the party! I can't believe she let you do it.My Emily would have never did that. She cries when I brush her hair :) Everyday is a little bit of torture when I whip out the hairbrush. I bet it looked beautifully! 12, 14, and 16! We were still using the sponge things and sleeping in them overnight. My daughter is 13 and the big style now is straight - poker straight. She's got thick, lush hair that can go curly when curlers are used and poker straight when she uses her newly acquired electric hair straightener. Is it wrong to be jealous of your daughter's hair? I figure this makes up for the torture when she was younger and it took forever to get through all the layers to get out the knots and keep her hair clean, smooth, adn just looking decent.